This is Priory’s 12th DVD in its series 'The Grand Organ'. The stunning camera work and sound in stereo or 5.1 surround has led to high critical acclaim and critics have hailed the series as “the greatest in the history of recorded organ music”. 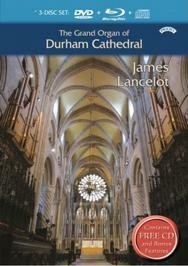 This release will add to this opinion and James Lancelot, organist of Durham Cathedral for many years, chooses 14 pieces to fully demonstrate an organ which is undoubtedly one of the very finest in the UK. Music by Whitlock, Bach, Stanley, Rheinberger, Haydn, Stanford, Franck, Vierne, Dupre, Alain, Hakim and Mulet form the recital which lasts for over 75 minutes. This is followed in the 'Bonus Features' by a fascinating and in depth Organ Tour which lasts for 90 minutes and includes connections with the Beamish Museum and Chinese Exhibition, all of which are filmed. The bonus features also include a demonstration of the Chamber organ in James Lancelot’s house. The filming takes place around the console, with shots from different angles as well as coverage of the pedals and pedalwork. Also we see the cathedral inside and out, and the surrounds in a comprehensive feature of the cathedral and its history. This is not just a DVD/BluRay for organ fans but for those that would like to see an organist playing from the console (a feature that is rarely seen in live performances) and demonstrating how the organ works. The BluRay in high definition pictures is stunning, and brings to life the history and architecture of this great Norman building.